My aunt has been making these rolls and I want her to get recognition for her hard labor. 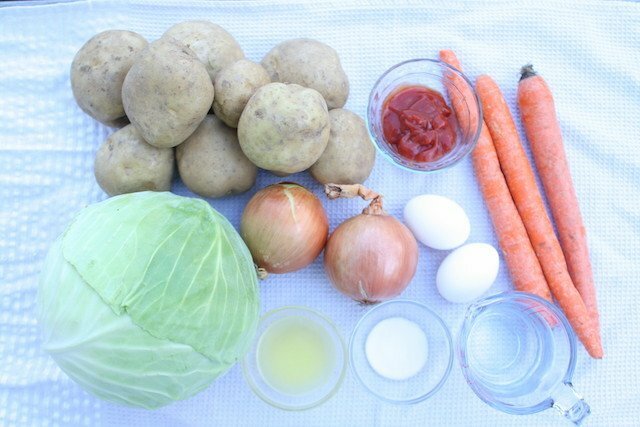 Golden potatoes are needed for this recipe, perhaps the starchiness level has something to do with the thickening from the golden potatoes but golden is the kind to use. My aunt told me this dish was favored by my grandpa and dad. 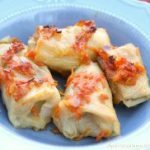 This dish is very versatile as my mother baked these with a bacon sauté before and when she had served these rolls, one of her guests said “I haven’t tried such rolls in my life!” I could imagine how good they probably were smothered in bacon. 1.) 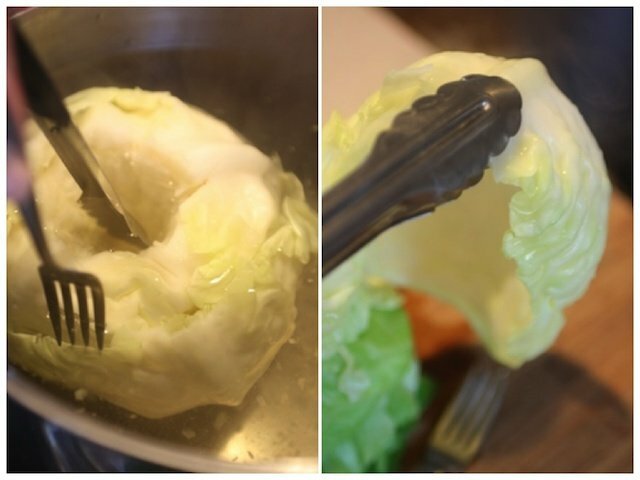 Add the cabbage to a pot of boiling water, core down and cook for 10 minutes. 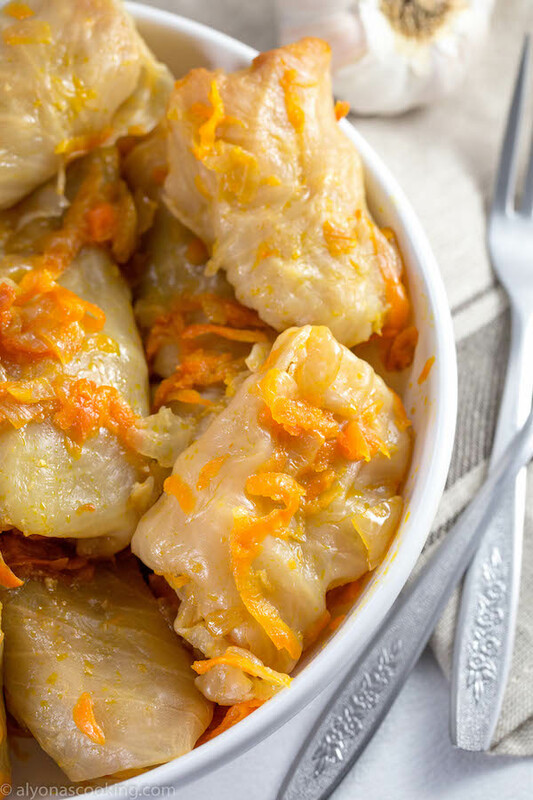 Carefully remove 4-5 leaves, allowing cabbage to simmer for an additional 5 minutes after each set of leaves removed. Discard any small remainder. 2. Finely grate or puree the potatoes and onion. 3. Add the eggs, oil, salt and melted butter to the pureed potatoes and whisk throughly; set aside. 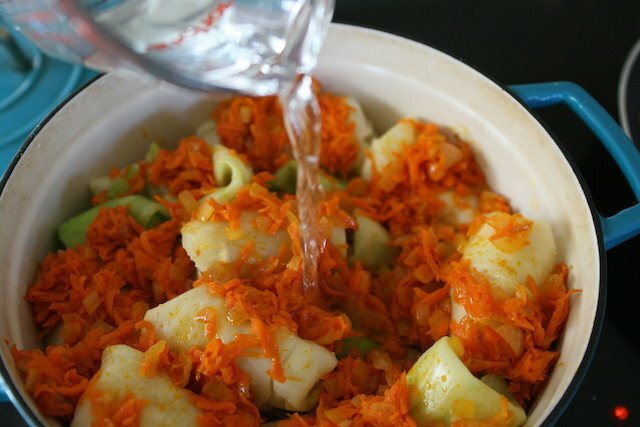 4) Sauté the onion and carrot in oil, over medium heat until tender. Add the ketchup and heat through. Set aside. 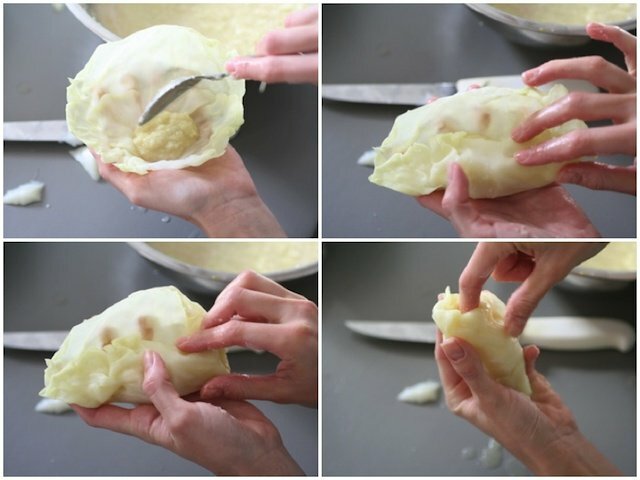 HOW TO ROLL THE SMALLER LEAVES OF THE CABBAGE : slice off the bump of the core and place 2-3 heaping tbsp of the potato puree into each leaf. Roll carefully folding in the sides and stack into a pot. 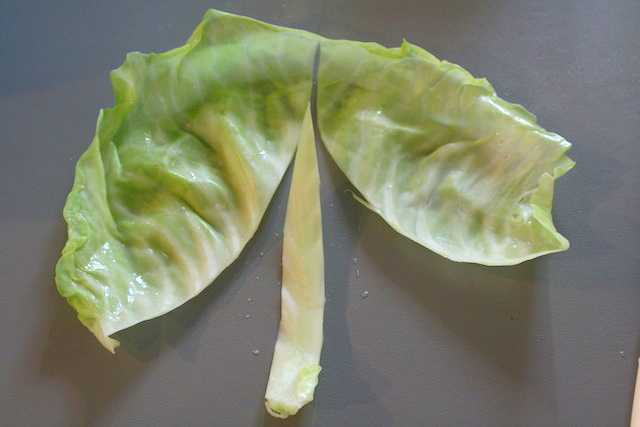 HOW TO ROLL LARGER CABBAGE LEAVES: Remove the middle of the stem, cutting leaf into two portions. Place 2 tbsp of the filling onto the bottom part and roll folding in the sides. 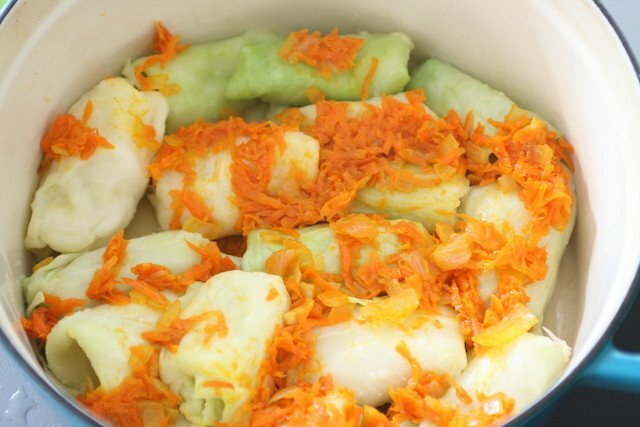 Evenly spread the saute mixture over each stack of rolls and pour 1/2 cup of water over the top. Bake in a pre-heated 350 degree oven for 1 hour and 45 minutes. Add the cabbage to a pot of boiling water, core down and cook for 10 minutes. 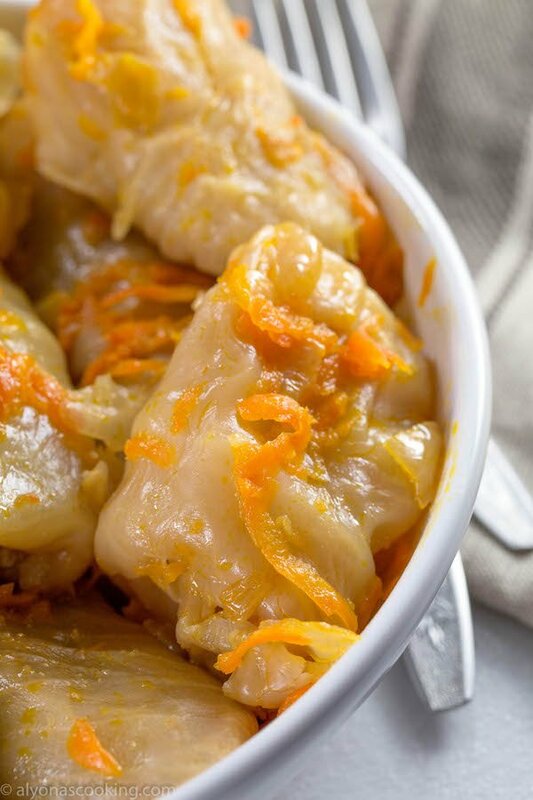 Carefully remove 4-5 leaves, allowing cabbage to simmer for an additional 5 minutes after each set of leaves removed. Discard any small remainder. 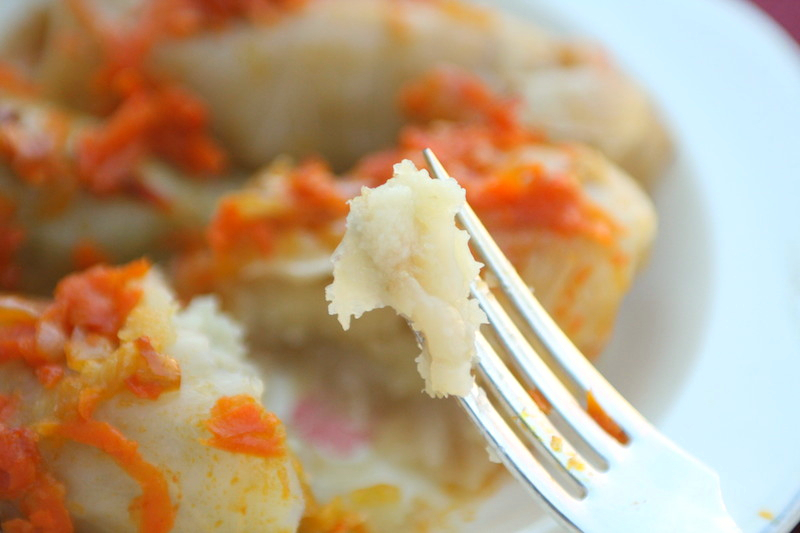 Finely grate or puree the potatoes and onion. 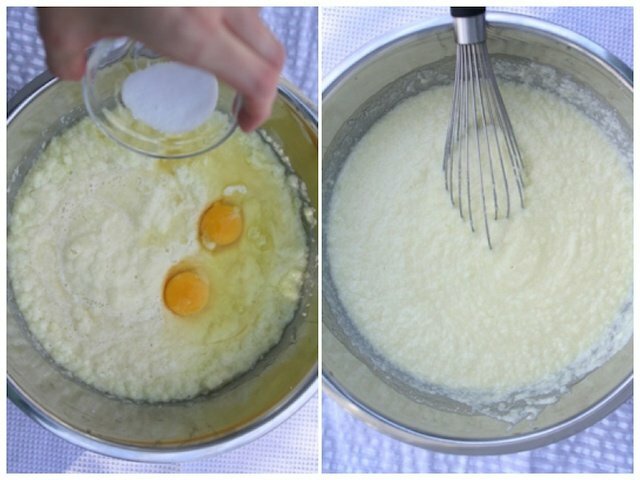 Add the eggs, oil, salt and melted butter to the pureed potatoes and whisk throughly; set aside. 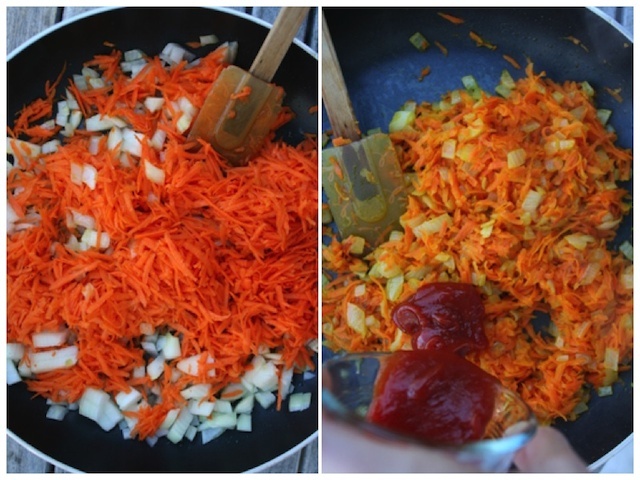 Sauté the onion and carrot in oil, over medium heat until tender. Add the ketchup and heat through. Set aside.